Perhaps you have a home office like us? Even if you just have a desk to pay bills, then you have a clutter issue. There is just so much stuff that goes into taking care of business, right? But you spend enough time at your desk that it should it be organized. And it should showcase your style as well. We found some amazing DIY desk organizing ideas and projects that will get your space simplified, and bring some pretty into the mix as well. And if you have to be at a desk, don’t you deserve to look at something pretty? 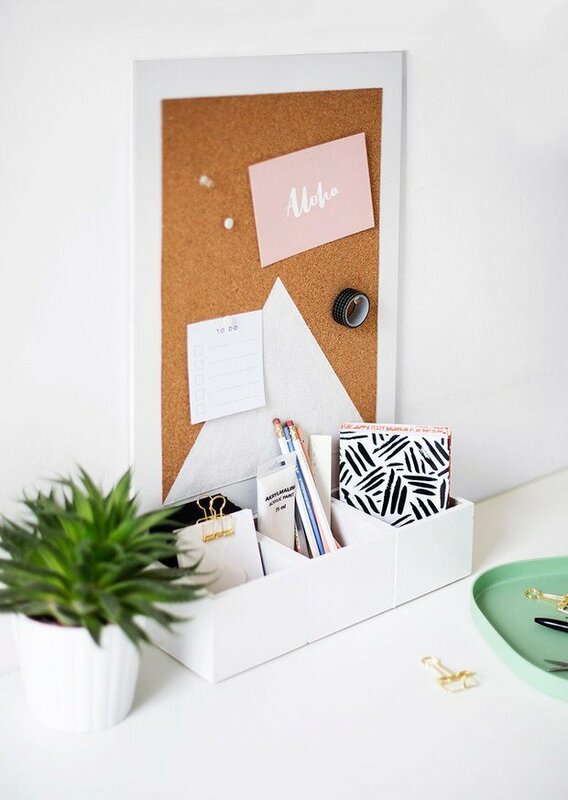 This DIY desk organizing idea from ‘Sugar and Cloth‘ is an easy project that not only gives you some places to store things, but also a cork board to pin up things that you want/need to look at! Get some pretty novelty push pins and tuck a few travel photos or other inspirational things up there in between the tax receipts and the to-do list. 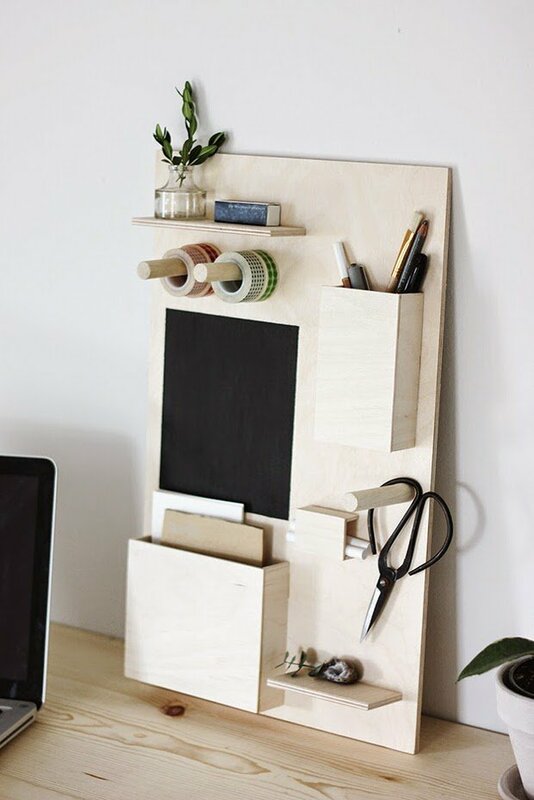 This DIY desk organizer from ‘ Poppytalk‘ is made from birch plywood and can be customized to have as few, or as many little storage spots as you need! Simple to follow tutorial. 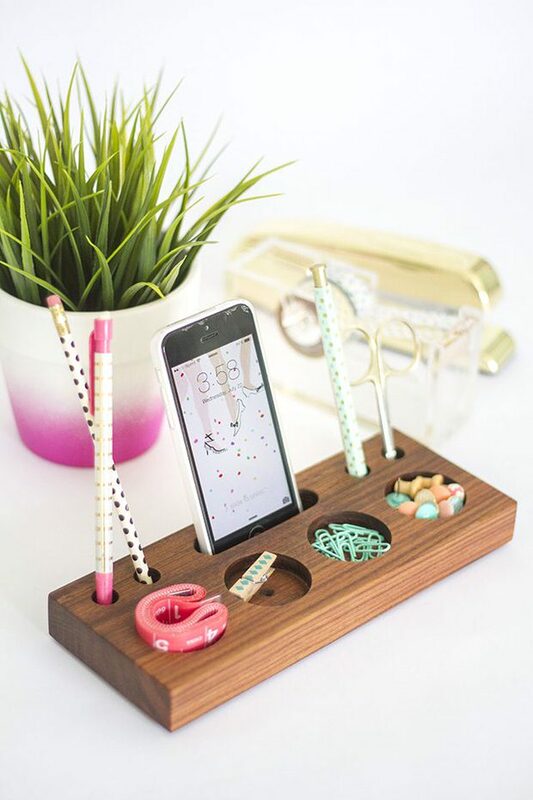 Learn how to make a modern desk organizer tray from a piece of wood from ‘Ehow‘. This is a great tutorial for an easy project that looks upscale and not at all cutesy. Love the spot for your phone! We are in love with this color block box supply storage from ‘ I Spy DIY’. Easy home office organization project with just enough color to brighten up your desk and your day, but corrals the “stuff”. Inexpensive too! Talk about clever desk organizing ideas & home hacks! 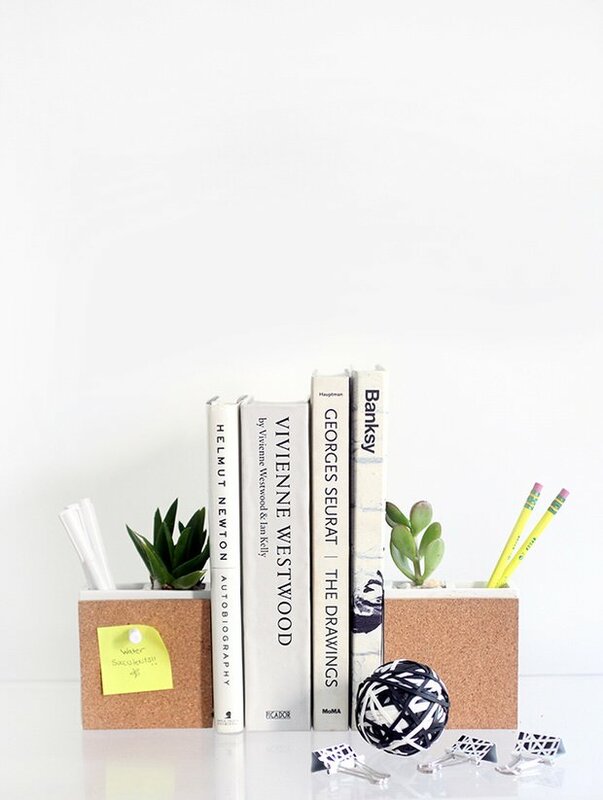 Another great project from ‘ I Spy DIY”, these DIY succulent and supply bookends are made from toothbrush holders and cork coasters! 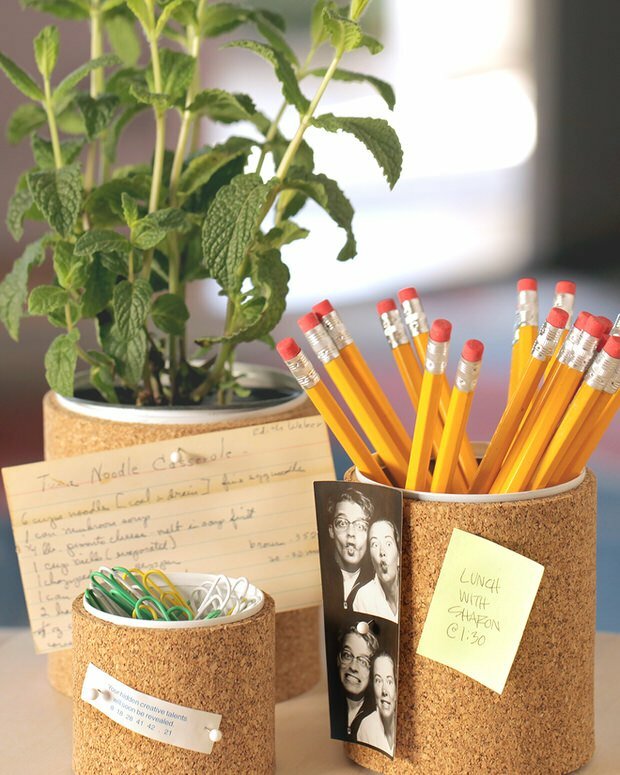 Fun and easy project that brings living plants to your desk, love it! 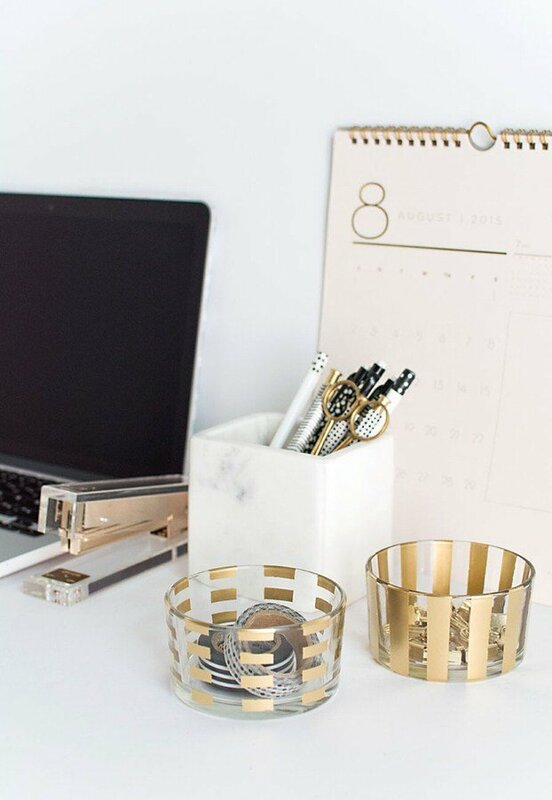 These DIY desk accessories are gold and glam, and thanks to the blog at ‘Pottery Barn‘, you can follow the tutorial to make them yourselves. Easy project. You could even use dollar store glass ware, then all you need is spray paint and some tape! From Robert at ‘Kin Community‘ is this video tutorial (it’s written too) on these DIY desk organizing ideas made from recycled cans and cork. Cute, easy and cheap! 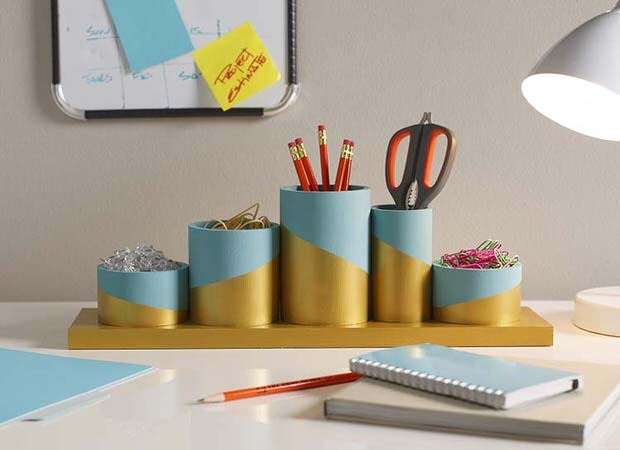 This DIY desktop organizer from ‘Home Depot‘ by ‘Plaid’ is a fun an colorful project using pvc pipe and paint. This would look really elegant glam if you painted it copper and silver! Because who doesn’t like metallics? These Kate Spade (love!) 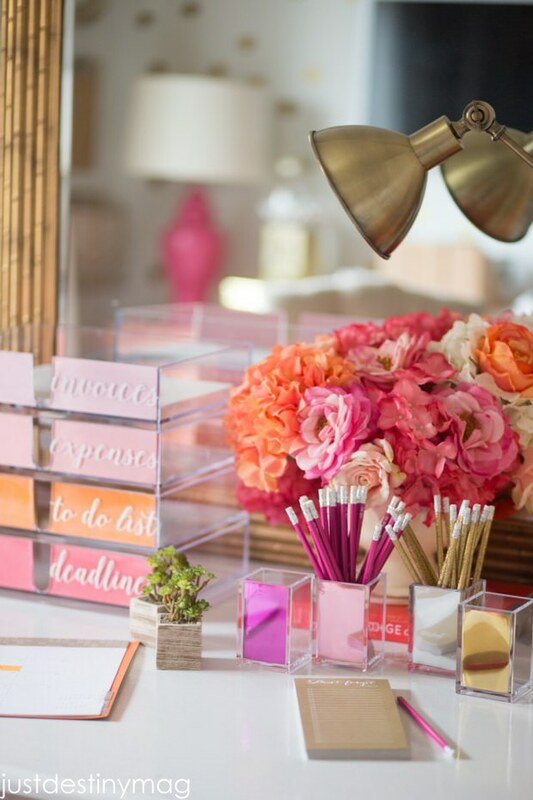 inspired DIY acrylic desk accessories from ‘Just Destiny‘ are girly and fun. She made them using letter containers from The Container Store, and some pink card stock. So pretty, and I love the label letters on the stackable file organizers! 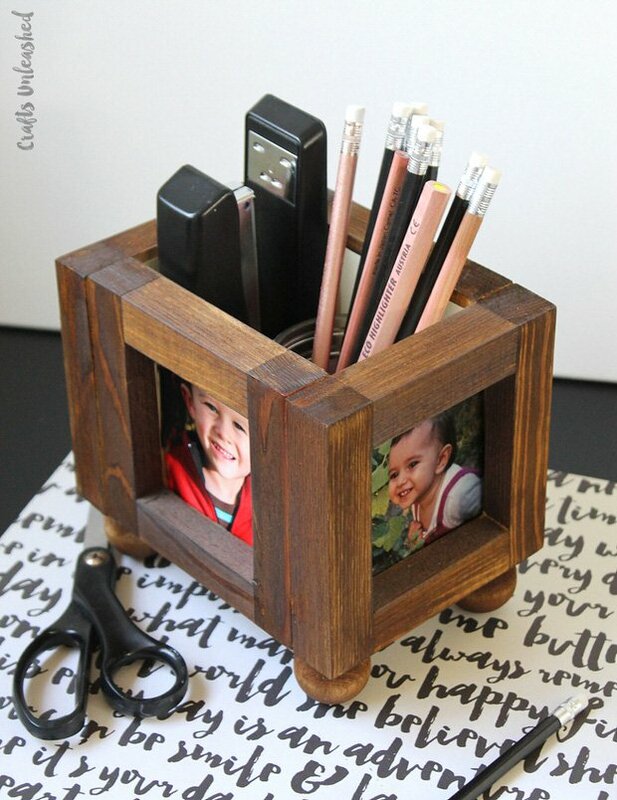 Lastly, this wood photo frame DIY desk organizer from ‘Crafts Unleashed‘ is made from exactly that… small wood photo frames! Add some ball feet and some stain, and then this would make a more masculine touch to any desk! 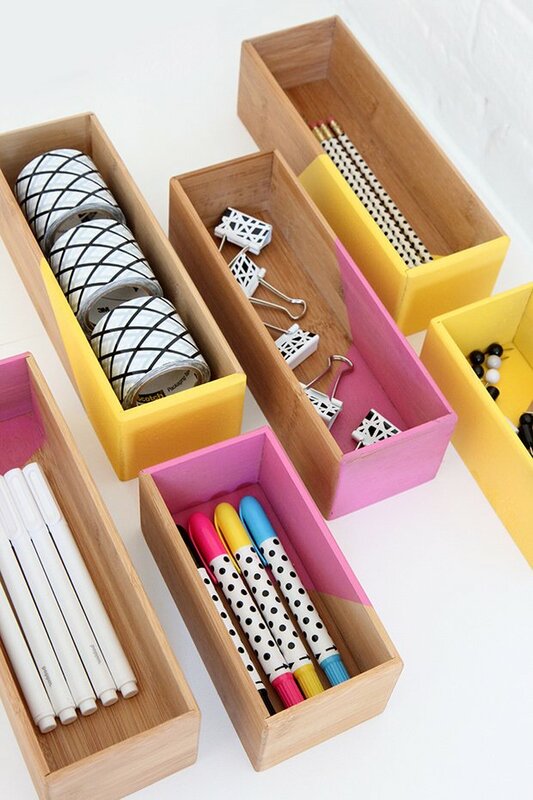 Did you enjoy this post on DIY Desk Organizing Ideas? Then be sure to jump over to Home Office Organizing Ideas and 7 Steps to An Organized Fridge. I’m getting ready to organize my little office area again and there were some really cute ideas here. I love the color block storage. Maybe if the inside of my drawers were prettier, they will stay cleaner! Thank you for posting this! Now that my daughter is back to school we need to organize her new desk. ‘Poppytalk’ and ‘Kate Spade’ are so far our favorites!